But since we have learn'd from effeminate France To eat their ragouts as well as to dance, We are fed up with nothing but vain complaisance. Oh ! 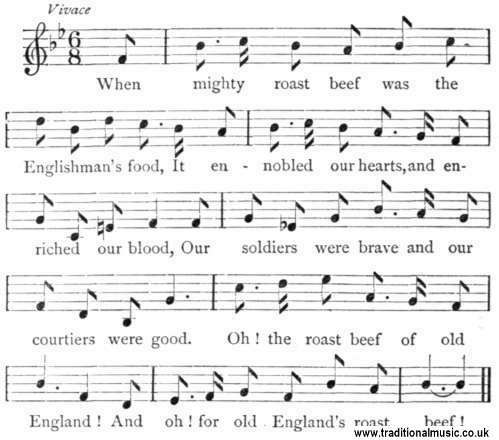 the roast beef, &c.
Our fathers of old were robust, stout, and strong, And kept open house, with good cheer, all day long, Which made their plump tenants rejoice in the song,�Oh &c.
When good Queen Elizabeth sat on the throne, Ere coffee and tea, and such slip-slops were known, The world was in terror if e'er she did frown.�Oh &c.